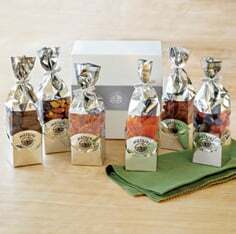 The mouth-watering flavor of our dried fruit satisfies like nothing else. It's all thanks to our 100%-natural drying process that transforms each fresh morsel into chewy, fruity bliss. Count on this selection of favorites to satisfy a holiday dinner crowd or the pickiest foodie on your gift list. Packed in 6oz. silver gift bags and beautifully gift-boxed. Also available without the gift box. 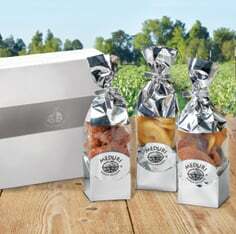 The Meduri Favorites Sampler Three-Bag Gift Set comes with the following: Harvest Pride® Peaches, Mandarin Orange Slices and Sweetglow® Apricots. 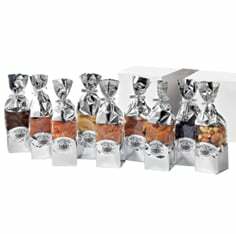 Explore more delectable unsulphured natural dried fruit sampler sets at Meduri World Delights!